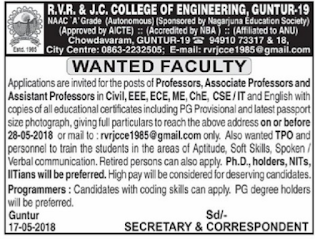 R.V.R & J.C College of Engineering, Guntur has advertised in THE HINDU newspaper for recruitment of Professor/Associate/Assistant Professor jobs vacancies. Interested and eligible job aspirants are requested to apply on or before 28th May 2018. Check out further more details below. 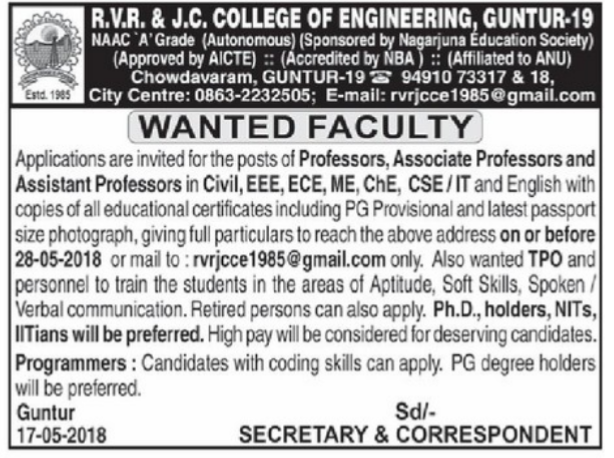 Name of the College : R.V.R & J.C College of Engineering, Guntur. About College: RVR & JC College of Engineering (Rayapati Venkata Rangarao & Jagarlamudi Chandramouli) is an engineering college in Guntur, offering graduate (Masters) and undergraduate education (Bachelors) courses in engineering and technology. It is located in the west suburban region of Guntur City, India.Established in 1985, RVR&JC is under the patronage of the Nagarjuna Education Society. Retired persons can also apply. Ph.D holders,NITs,IITians will be prefered. Candidates with coding skills can apply. PG Degree holders will be prefered. High pay will be considered for deserving candidates. How to Apply: Interested candidates can send copies of all educational certificates including PG provisional and latest passport size photo giving full particulars to below address or mail on or before 28.05.2018.